Visit Trinity Beach and Palm Cove Beach for some beach relaxation. Step out of the city life by going to Nature & Wildlife Tours and Australian Butterfly Sanctuary. Explore the numerous day-trip ideas around Cairns: Herberton (Historic Village Herberton & Spy & Camera Museum). For more things to do, other places to visit, and tourist information, read Cairns journey planner. Springfield, USA to Cairns is an approximately 26-hour flight. You can also do a combination of bus and flight; or do a combination of bus, train, and flight. Due to the time zone difference, you'll lose 16 hours traveling from Springfield to Cairns. Plan for a bit warmer temperatures traveling from Springfield in May, with highs in Cairns at 82°F and lows at 69°F. Cap off your sightseeing on the 17th (Fri) early enough to go by car to Port Douglas. Start off your visit on the 18th (Sat): view the masterpieces at Des Spencer Galleries, then meet the residents at Wildlife Habitat Port Douglas, and then identify plant and animal life at Mossman Gorge. Get ready for a full day of sightseeing on the 19th (Sun): look for all kinds of wild species at Daintree National Park. To see other places to visit, reviews, and tourist information, you can read our Port Douglas tour planner . Drive from Cairns to Port Douglas in 1.5 hours. Alternatively, you can take a bus; or take a shuttle. May in Port Douglas sees daily highs of 82°F and lows of 69°F at night. Finish your sightseeing early on the 19th (Sun) so you can travel to Alice Springs. Escape the urban bustle at Simpsons Gap Bicycle Path and Emily Gap. You'll explore the less-touristy side of things at Alice Springs School of the Air Visitor Centre and The Emily and Jessie Gaps Nature Park. The adventure continues: look for all kinds of wild species at Alice Springs Desert Park, take in the local highlights with Walking tours, take some stellar pictures from Anzac Hill, and steep yourself in history at Alice Springs Telegraph Station Historical Reserve. To find photos, maps, reviews, and more tourist information, read Alice Springs trip builder app . Getting from Port Douglas to Alice Springs by combination of shuttle and flight takes about 5.5 hours. Other options: drive; or take a bus. Traveling from Port Douglas in May, you will find days in Alice Springs are little chillier (76°F), and nights are cooler (47°F). Wrap up your sightseeing on the 22nd (Wed) to allow time to travel to Margaret River. 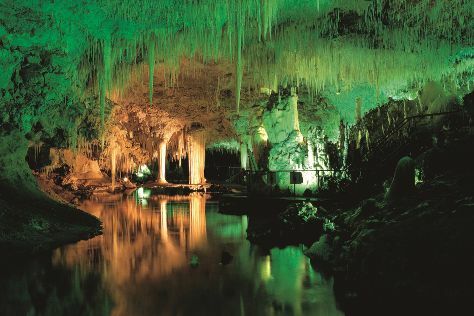 You'll discover tucked-away gems like Cowaramup Bay and Mammoth Cave. Visit Hamelin Bay Jetty and Cape Leeuwin Lighthouse for their historical value. Change things up with a short trip to Jewel Cave in Augusta (about 32 minutes away). Next up on the itinerary: stroll through Margaret River Mouth Beach, indulge your senses at some of the top wineries in the area, explore the fascinating underground world of Lake Cave, and learn about winemaking at Redgate Wines. Traveling by combination of flight and bus from Alice Springs to Margaret River takes 9.5 hours. Alternatively, you can drive; or do a combination of train and bus. Due to the time zone difference, you'll gain 1 hour traveling from Alice Springs to Margaret River. Wrap up your sightseeing on the 25th (Sat) to allow time to travel to Broome. Let the collections at SSJG Heritage Centre and Broome Historical Museum capture your imagination. Visiting Nature & Wildlife Tours and Malcolm Douglas Crocodile Park and Animal Refuge will get you outdoors. Next up on the itinerary: explore the different monuments and memorials at Japanese Cemetery, stroll through Cable Beach, take in the exciting artwork at The Courthouse Collection, and don't miss a visit to Gantheaume Point. To find maps, photos, ratings, and tourist information, you can read our Broome trip itinerary maker website . Getting from Margaret River to Broome by combination of bus and flight takes about 9 hours. Other options: drive; or take a bus. In May, daytime highs in Broome are 90°F, while nighttime lows are 66°F. Wrap up your sightseeing on the 28th (Tue) to allow time to travel back home. Kick off your visit on the 29th (Wed): enjoy the sand and surf at Seven Mile Beach, then get engrossed in the history at Narryna Heritage Museum, then take in the spiritual surroundings of St. David's Cathedral, and finally explore the world behind art at Lady Franklin Gallery. Here are some ideas for day two: take a memorable tour with Tours. To find more things to do, maps, photos, and other tourist information, you can read our Hobart journey planner. Fly from Broome to Hobart in 9 hours. Alternatively, you can do a combination of car and ferry. The time zone changes from Australian Western Standard Time (AWST) to Australian Eastern Standard Time (Tasmania) (AEST), which is usually a 2 hour difference. Prepare for colder weather when traveling from Broome in May: high temperatures in Hobart hover around 60°F and lows are around 43°F. Wrap up your sightseeing on the 30th (Thu) early enough to drive to Port Arthur. Kick off your visit on the 31st (Fri): appreciate the extensive heritage of Cape Raoul, see the interesting displays at Federation Artisan Chocolate, then hike along Waterfall Bay, then appreciate the history behind Dog Line, and finally take an in-depth tour of Eaglehawk Neck Historic Site. On the 1st (Sat), you'll have a packed day of sightseeing: immerse yourself in nature at Lime Bay State Reserve. To find traveler tips, ratings, maps, and tourist information, go to the Port Arthur trip site . You can drive from Hobart to Port Arthur in 1.5 hours. Alternatively, you can take a bus. In May, plan for daily highs up to 60°F, and evening lows to 43°F. Wrap up your sightseeing by early afternoon on the 2nd (Sun) to allow time for travel back home.